An obsidian pressure plate in front of a door. 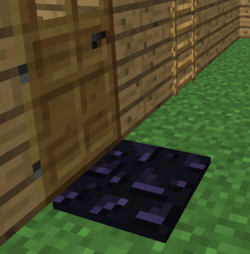 Obsidian Pressure Plates is a mod which adds Obsidian Pressure Plates that are made out of Obsidian. They can only be activated by players. It is a standalone mod made by Myrathi, created specifically for Feed The Beast. Obsidian pressure plates seamlessly blend into an obsidian floor when stood upon, and are quite hard to see otherwise. They also take significantly longer to break than normal pressure plates. As of 1.5.2, the pressure plate can be modified to be silent and/or almost invisible. This page was last modified on 23 December 2015, at 21:46.